One of my favourite sections in the Harvard Business Review is “Defending Your Research” where researchers literally have to defend their (PhD) research to the reader. In April Anouk Festjens had to defend her research. Ms Festjens indicates there is a long history of research showing that Men clearly indulge in more risky economic decisions after exposure to sexual cues (pictures of female models, etc.) BUT women did/do not. 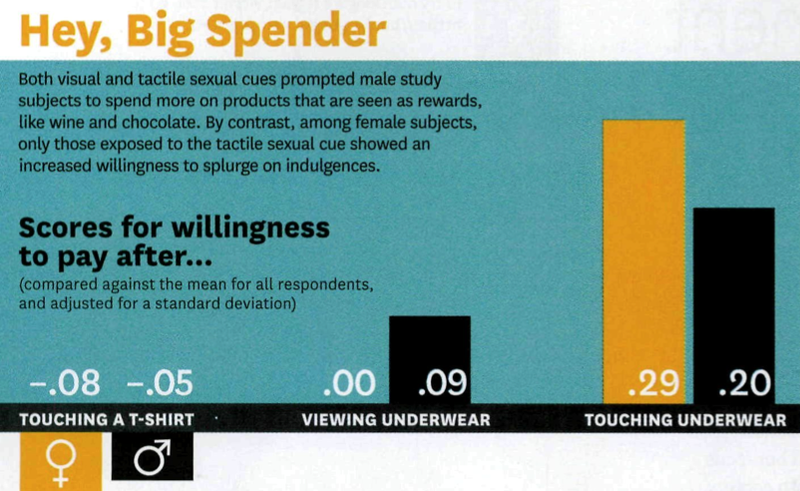 However, her research project uses touch as the trigger of a sexual cue (touching grey or black boxers vs. touching grey or black T-shirts). Women who handled boxers were more likely to spend money on wine and chocolate. So, next time you are folding laundry… be careful what you touch last before you go online to manage your investment portfolio or pursue some serious online shopping!